Some four months of planning and work went into the room party at CONvergence 2000, which was held in the St. Paul Radisson on July 6-9, 2000. It was an adventure, to say the least. Here is the grueling tale, as told by the web minion, Melissa. Look here to see all the culprits involved. The Celestial "Who"ligans' CONvergence 2000 report. They weren't trapped in a single room party all night like I was. 07062000 Thursday is usually a day for setup for the convention, not a day for partying. I took the day off work and spent most of it shopping and cooking up treats for our upcoming party. 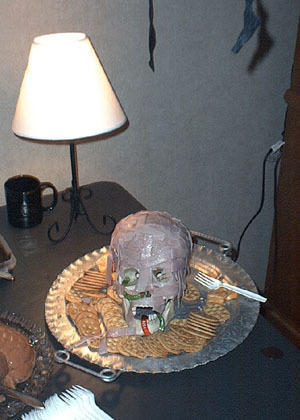 I recently obtained a brain-shaped Jell-O mold from stupid.com, and I stirred up two watermelon-flavored brains to accompany the pudding, Oreo cookies, olives, Rice Krispie bars, and other various treats I had picked up. Ted picked up five pounds of dark roast coffee for the room. I also mixed up some mulling spices for the cider I expected to serve up. Around 7:30 PM, Ted whisked me away to a scotch-tasting party at the hotel. Even though I had ample work yet to do for the room tomorrow, I figured I would go along so I could at least see the hotel ahead of time. The Radisson St. Paul has a terrible location and parking situation for a convention, but I must admit, our room, number 109, was a splendid one. It's a poolside cabana with two sliding doors that open directly to the pool. It's perfect for party-cruisers. After the brief room inspection, Ted and I traveled to the 11th floor to join about 15 other people to taste some 18 bottles of scotch. A gentleman named Kyle, clad in a kilt, happily led the festivities by first announcing each scotch, and then giving us each a small plastic shot glass with a sample. [Editor's note: Kyle deservedly achieved Cthulhu Coffee minionhood in 2001.] I absorbed as much as I could, since I know very little about scotch, but the task became progressively more difficult as I neared my 18th shot. Regardless, it was a great time with very fun and interesting people. I also learned from Kyle that my usual scotch of choice, Macallen 18 year, is considered one of the finest on the planet. I made a note to bring some to share at the convention. 07072000 Surprisingly, I woke up at 5:00 AM with not a hint of a hangover (yeah, yeah, I know you hate me). I finished my preparation of foods at home, packed my intrepid Honda Civic to capacity, and drove to Saint Paul. I arrived at the hotel around 1:00 PM. Since the dealer's room opened at 2:00 PM, I picked up my ID tag and found a few people to chat with until then. At 2:00 PM, I dropped off 35 Cthulhu Coffee mugs with Sharon's sister, Sandy, who offered to sell the items for us. I was able to get the room by 3:00 PM, and wound up unpacking the car and setting up most of the room by myself (I was pissed, but it was my fault. I never told anyone when to show up.). Around 5:00 PM, Ted, Sharon, and Mark showed up, and we all rushed to have the room prepared by 6:00 PM, our opening time. Luckily, by 6:00 PM, we had streamers, blacklights, glow-in-the-dark stars, stereo, the food, coffee, cider, and punch in place and ready, and we threw our doors open to the public. 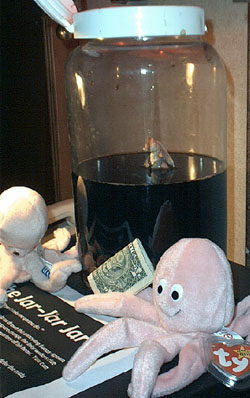 A popular draw for our party was the Jar-Jar Jar (which you can see at left), an idea I conceived last year while talking to George at CONvergence 1999. I hot-glued a Jar-Jar Binks action figure to the bottom of a large plastic jar and then filled the jar with a few inches of coffee. I then attached a sign that indicated that partygoers should toss in spare change until the inky waters rose high enough to drown the creature. It was very, very popular. Around 10:30 PM, Ted, who volunteers as hotel crew during the convention, was called away to take care of some issues regarding some brawling in the main ballroom. Paul and I manned the party until midnight, then shut the doors and cleaned up. I managed to get to sleep at 3:00 AM. 07082000 Ted and I woke up at 8:00 AM, and he promptly went on shift with the hotel volunteers while I quickly prepared the room for our morning event. I had no idea what the turnout would be, and was frankly a bit discouraged by the lack of traffic, encouragement, and help the night before. Regardless, I arranged five flavors of Pop Tarts on a platter next to a toaster, brewed some more coffee, set out some orange juice, and hooked up my DVD player to the hotel TV. At 9:00 AM, I opened the doors and waited. About ten minutes later, I was joined by a young man who had actually heard about our Saturday Morning Live-Action Cthulhu Cartoons, so I started the movie, the special edition ot Re-Animator. Within another ten minutes, we were joined by about five more people, who happily munched on Pop Tarts while we watched the heads fly onscreen. After we finished the film, I remembered that Rick had the foresight to bring extra DVDs to the room. I looked through what he had brought, and popped in Galaxy Quest, which is not an appropriate Cthulhu film, but definitely a great convention flick. Several more people joined the viewing, making for a successful early morning event. My confidence in the room party returned. I closed up the room at noon and wandered the convention for a while. At 3:00 PM, Cthulhu Coffee was scheduled to go up against Starwood, the Christian sci-fi group, in a UFO trivia tournament in the Gadgeteer's Petting Zoo. I showed up, hoping that a few of the other members would remember about it (I was only supposed to get three more people, but I was bad at informing people). To my glee, Ted was already there, and we were quickly joined by George, Rick, Paul, Sharon, and Mark. Starwood collected an equal amount of members, and we waited. And waited. Richard Caylor, who had the questions for the trivia contest, was missing. Regardless, we picked up the buzzer system (one of Richard's creations) and the MC (a Klingon in a tux), and winged it. We had no audience or questions, so we just played around for half an hour. The MC made up a few questions about UFOs, and then asked a few things like, "What should we do with Richard once we find him?" (Best answer: "Dress him as Jar-Jar Binks, duct tape his mouth shut, and throw him into the convention to be torn apart by sci-fi fans." Runners up: "Eat his head." and "Make him watch Johnny Mnemonic.") After half an hour, we all gave up. I went back to the room and discovered that Ted had bought a T-shirt for me: a Miskatonic University varsity-style shirt (Go pods!). I'm so glad I told him to never buy me flowers! He's so sweet! Ted and I then napped until 5:00 PM, when we had to begin setting up the party again. Paul showed up with two bags and a box full of supplies: more gummy worms, spices for the cider, cheese, and all sorts of things we needed, plus a whole box of dry ice! Yes! Fun! Almost better than pyromania! At 6:00 PM, we opened to the public again, and this time the party went much better. Ted and I agreed to trade off watching the room, and Paul, who was once a caterer, was a tremendous help. Thus, since we could all get away from the room here and there, tensions were lower, and we all had a good time. I was even able to get away to see part of the Masquerade. Unfortunately, I missed our George going on-stage as Ming the Merciless (as the audience chanted, "Hail, Ming! "), but luckily Paul got to see the whole thing. Later in the evening, when most of the Cthulhu Coffee crew was in the room, a gentleman from the South joined our party and sat a spell. He was extremely interesting to talk to, because he was very much a part of the convention community, as a person who attends many different conventions in mid-America. It was wonderful to get his perspectives on this convention, on Minnesota, and on Minnesotans. Since I have only attended Minicon and CONvergence, both in Minnesota, speaking to him made me all the more interested in attending WindyCon later this year. I would love to have the sense of perspective this gentleman had. The party progressed well into the evening, closing up around 2:00 AM or so. Ted and I cleaned up the room and fell asleep very quickly. The only part of Jar-Jar still visible above the coffee were his eyes and a bit of hand (I later learned that the jar contained $50 in donations, plus one Geek Squad pin). Our meat-head, a culinary delight consisting of a plastic skull covered in slices of ham, was also a popular sight and the subject of many photos (seen at right). 07092000 Sunday, as usual, is relatively uneventful at this convention. Ted helped me pack up the room at 9:00 AM, then went on hotel duty for the rest of the day. I checked out of the room, hung out with Paul, Rick, and Sharon for a while, and haunted the dealer's room. Sandy had successfully sold 30 mugs (! ), and I had a great time chatting with a woman who sold action figures, tiny toy weapons, and doll house accessories. Paul and I then went to the Gadgeteer's Petting Zoo to watch a Sumo Robot tourney, which is not entirely unlike Robot Wars, only that the robots are not remote controlled. Paul and I then attended closing ceremonies just to learn how successful the convention was. Incredibly, 1,601 people had registered this year, up 100 people from last year, despite the fact that the convention was in the wrong hotel. A good time was had by all, despite the rather ugly problems that were happening between the executives of the convention and the executives of the hotel. So, that's the end of the tale. I want to humbly thank all of the Cthulhu Coffee minions, especially Ted, Paul, Rick, Sharon, and Mark, who did a lion's share of the work for our presence at the convention. Humble thanks also goes to Richard Caylor, Don and Tabby St. Hilaire, Linda Peterson, the Jar-Jar Jar contributors, and the extra-nice Radisson housekeeping staff, and anyone else I might have forgotten, for their help in making the Cthulhu Coffee room party work.